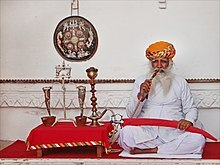 A man from India, wearing a Rajasthani paggar style of turban. Pagri, Pagadi (Hindi: पगड़ी, Bengali: পাগড়ি, Marathi: पगडी, Gujarati: પાઘડી, Punjabi: ਪੱਗ, Urdu: پگڑی‎) is the term for turban originating in the Indian subcontinent. It specifically refers to a headdress that is worn by men and women, which needs to be manually tied. Other names include Sapho (Gujarati: સાફો) and Fagri (Sylheti: ꠚꠣꠉ꠆ꠠꠤ). A Pagri is usually a long plain unstitched cloth. The length may vary according to the type. The cloth indicates the region and the community of the wearer. Man's Leheria turban, India, Rajasthan, 19th century. The paag is a headdress in the Mithila region of Bihar and in Mithila, Nepal and is worn by Maithil people. It is a symbol of honour and respect originating from the Mithila, India region. Pheta is the Marathi name for the traditional turban worn in Maharashtra, India. In ceremonies such as weddings, festive and cultural and religious celebrations as well it is common to wear Pheta. In many parts it is customary to offer male dignitaries a traditional welcome by offering a Pheta to wear. A traditional Pheta is usually long cloth typically 3.5 to 6 meters long and 1 meter wide. The choice of colour may indicate the occasion for which it is being worn and also may be typical to the place it is being worn in. Typical colours include Saffron (to indicate valour) and White (to indicate peace). In the past, wearing a Pheta was considered a mandatory part of clothing. Mahatma Phule pagadi famously worn by the Maharashtrian reformer, the activist from whom it gets the name. The Peta is a turban worn in Mysore and Kodagu, it is the traditional indigenous attire worn by the erstwhile Kings of Mysore, called the Wodeyars (1399 to 1947), of the Kingdom of Mysore. Wodeyars wore a richly bejeweled turban made of silk and jari (gold threaded lace) to match with colorful dresses as part of the royal dress. Turbans worn in Rajasthan are referred to as the Pagari. They vary in style, colour and size. They also indicate a wearer's social class, caste, region and the occasion it being worn for. Its shape and size may also vary with the climatic conditions of the different regions. Turbans in the hot desert areas are large and loose. Farmers and shepherds, who need constant protection from the elements of nature, wear some of the biggest turbans. The Rajasthani turban also has many practical functions. Exhausted travellers use it as a pillow, a blanket or a towel. It can be used to strain muddy water. An unravelled turban can also be used as a rope to draw water from a well with a bucket. Prominent styles are Pencha, Sela and Safa, although several local variants exist. A conventional Pagari is usually 82 inches long and 8 inches wide. A Safa is shorter and broader. Ordinarily a turban of a single colour is worn. However, turbans of one of more colours may be worn by the elite or during special occasions such as festivals or weddings, etc. Rajasthani turbans are a prominent tourist attraction. Tourists are often encouraged to participate in turban-tying competitions. A Dastar is a Pagri worn by Sikhs. It is mandatory for all Khalsas, i.e., Amritdhari (Initiated) Sikhs, to wear one. Styles may vary between different Sikh orders and regions. A Sikh turban plays an important part of the unique Sikh identity. It is worn to cover the long, uncut hair (termed kesh) that is one of the five outward symbols ordered by Guru Gobind Singh as a means to profess the Khalsa Sikh faith. The most commonly worn styles of dastar include PatialaShahi dastar, Morni/Pochvi dastar, Amritsar Shahi dastar, Canadian style and many more regional. In Punjabi dialects pagri is often shortened to Pagg. Peshawari Pagri has been traditionally worn in Peshawar. It includes a cap called kulla and the cloth wrapped around it called lungi. In several Indian Coffee Houses and restaurants waiters wear turbans with a fan-like attachment on the side. A Pagri is a symbol of honour and respect in all the regions where it is a practice to wear one. A Pagri's association with honour also lends its use in a figure of speech in associated languages. The figure of speech pagri uchaalna in Hindi (literal translation: to toss the turban) implies causing the loss of honour. ^ "Pride of tying Turbans". Travelersindia.com. ^ "Kolhapuri Pheta". Kolhapur World. Archived from the original on 2012-10-02. ^ "From baseball caps to phetas!". ^ a b "Rajasthan at a glance". Rajasthanunlimited.com. ^ "Rajasthan traditional dresses". greatindianholiday.com. This page was last edited on 14 April 2019, at 03:06 (UTC).